Create a new Bizagi project to get started automating your processes. This project will run in a .NET platform. Since every project requires a database. 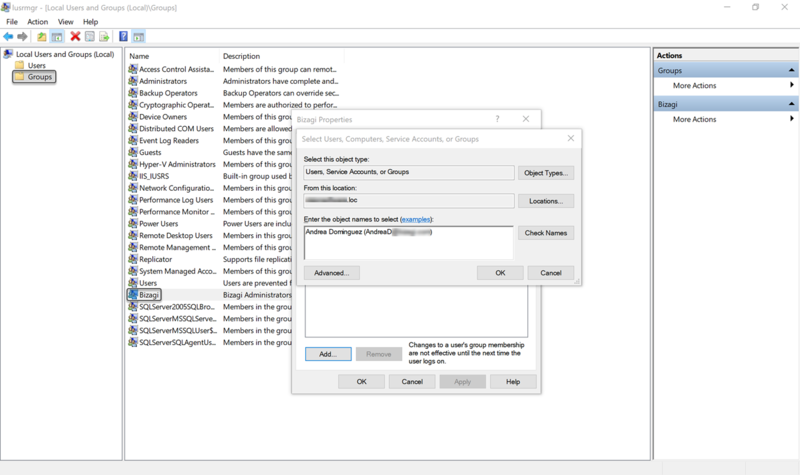 When using SQL Server, you can chose the authentication mode desired, being using SQL credentials or Windows authentication. 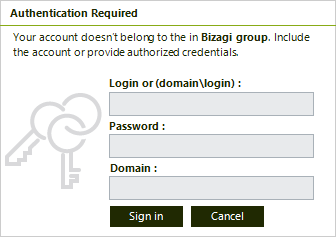 By default Bizagi uses SQL credentials. 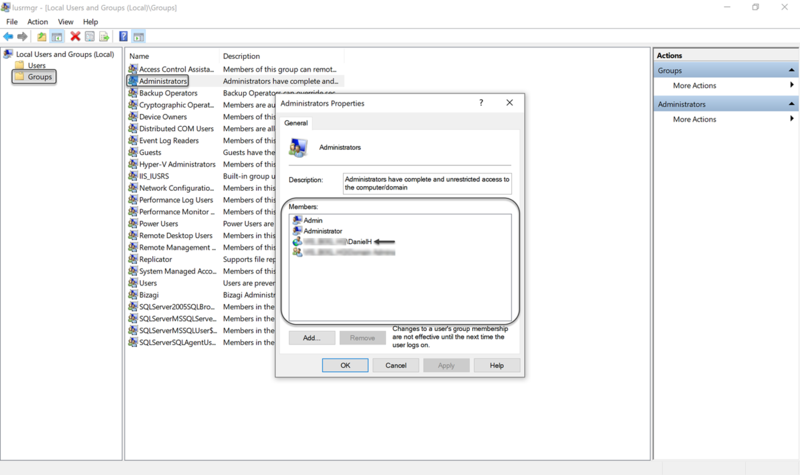 If you want to use Windows Authentication for your SQL Server instance, you can skip the following section and go to the procedure explained in Using Windows Authentication for SQL Server. Keep in mind that in order to create a project, your account needs to belong to both the local Bizagi and the Administrators group (where Bizagi Studio is installed). •open the Edit Local Users and Groups utility on Windows. •Click on the Groups option. oFind the Administrators Group and make sure your user is included. If it is not add it by clicking the Add option and entering your user (as it is shown in the image below). oFind the Bizagi Group and make sure that your user is included. If it is not add it by clicking on the Add option and entering your user (as shown in the image below). Make sure you name your project and define its location. •The Advanced database configuration checkbox, to specify details for the database server used by this new project. Through this option you explicitly define where you want to create the database (should you have more than one available database server installed). For a quick start setup, you may disregard the Advanced configuration, and leave its checkbox unticked. 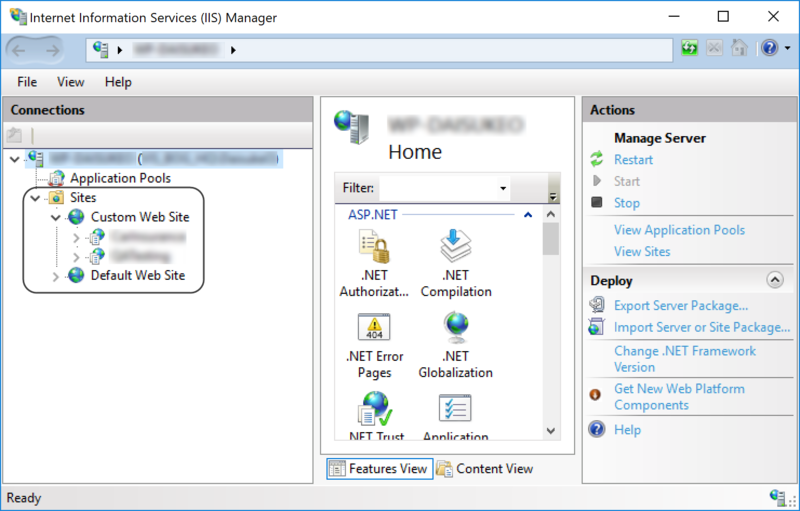 •The Advanced IIS configuration checkbox, to explicitly decide if under which IIS web site you wish to create the Bizagi Work portal. 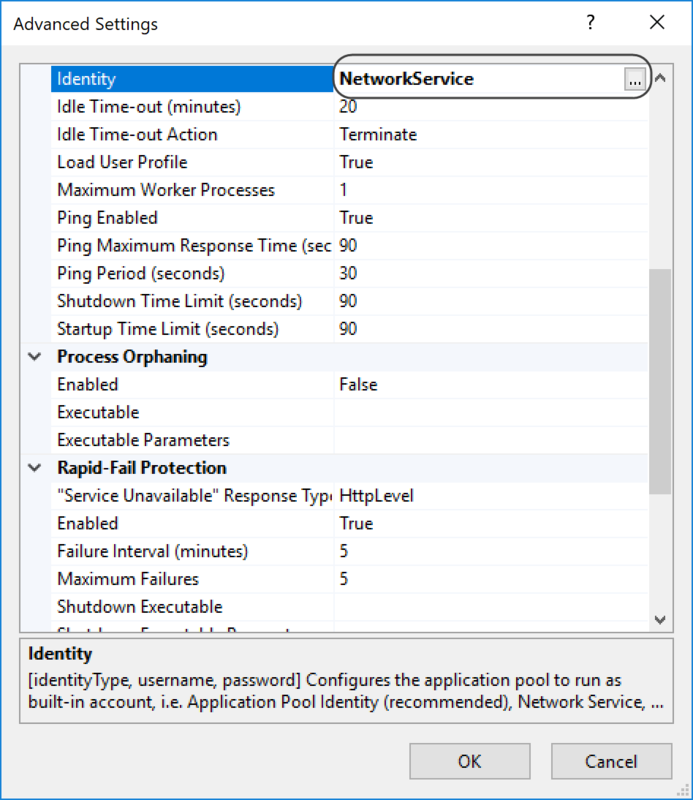 This option requires that you have IIS already installed (not applicable for IIS Express). 3. Enter the database server details. If you chose to activate the Advanced database configuration, make sure you specify where you want your processes repository to be. 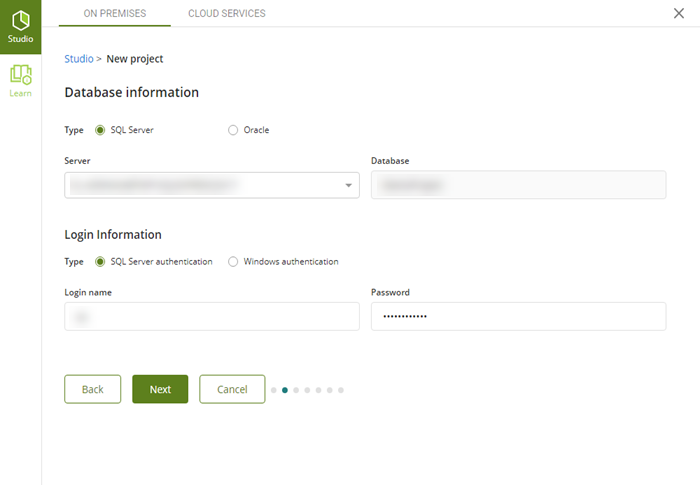 Otherwise this screen will not be shown, and Bizagi automatically chooses the default eligible database server. Notice that the database can be stored on the local computer or a remote server. You can use the SQL Server database that Bizagi Studio installs. •If you use the SQL Server database that Bizagi Studio installs (or a local instance), make sure you have at least 300 MB of free disk space in your C:\ hard drive. Otherwise, when using a SQL Server database server (in a remote machine) make sure you have at least 300 MB of free disk space in that server. 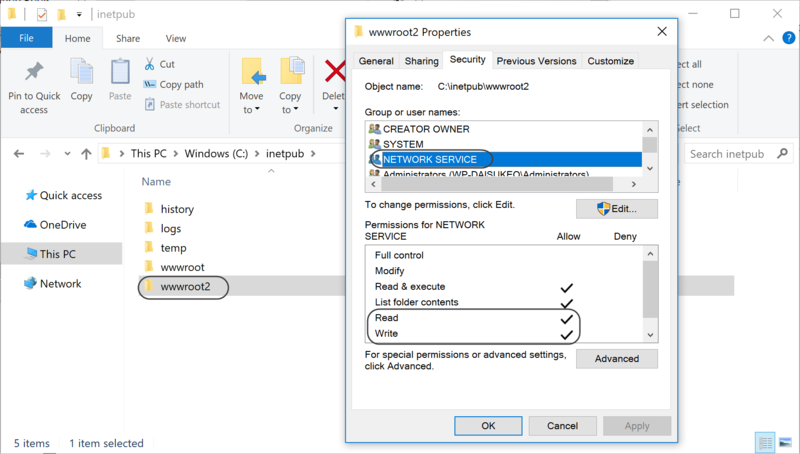 •If you want to use Windows Authentication for your SQL Server instance, go to the procedure explained in Using Windows Authentication for SQL Server. •Server: The name of the Database Server containing the SQL Server instance. •Database: The name of your project. Bizagi will create a database with this name. •Password: The password for the specified Login name. 4. Define the target IIS web site. If you chose to activate the Advanced IIS configuration, make sure you select from the drop-down list, that IIS web site where you want Bizagi's Work portal to be created. It is very important that before choosing an IIS web site, you double-check that the web site's configuration is adequate. 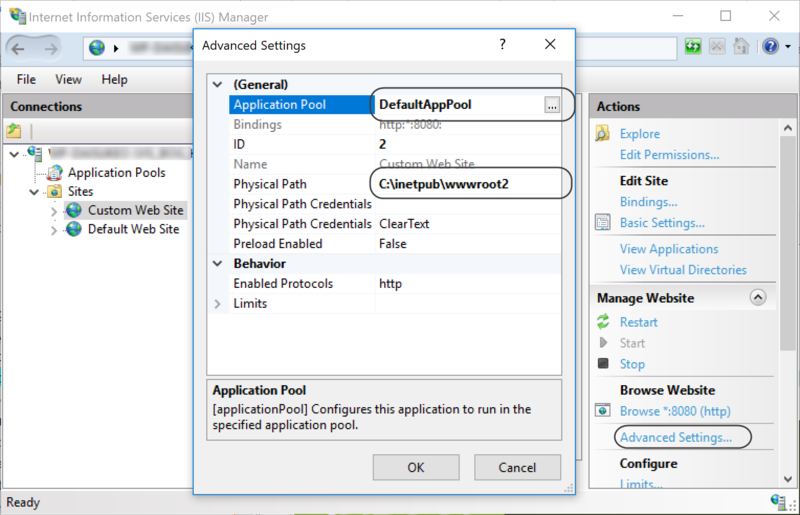 Adequate configuration implies that the IIS application pool set for this web site, is set to use (impersonate with) an account which has read and write access to that web site's base folder. You may check this by first ensuring which IIS application pool is being used by the given IIS web site. From the above image, notice that you gather the name of the Application pool (e.g. DefaultAppPool), as well as its base folder (e.g., C:\inetpub\wwwroot2). 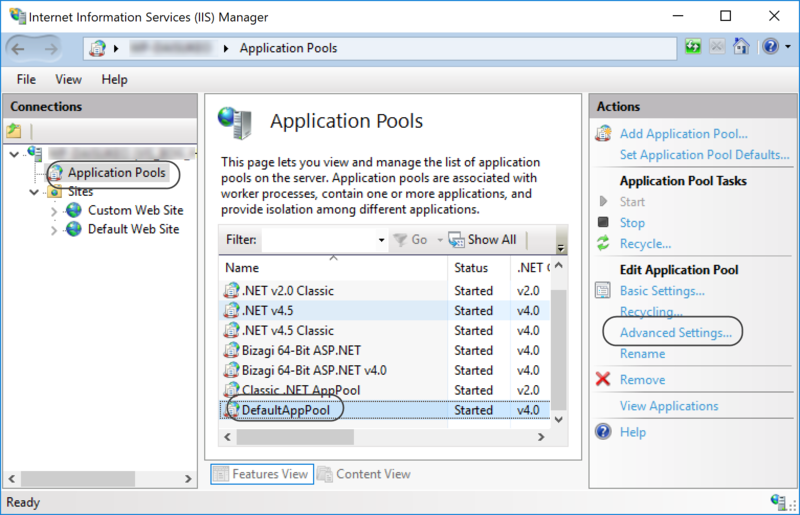 Close the window and move unto the Application Pools view. 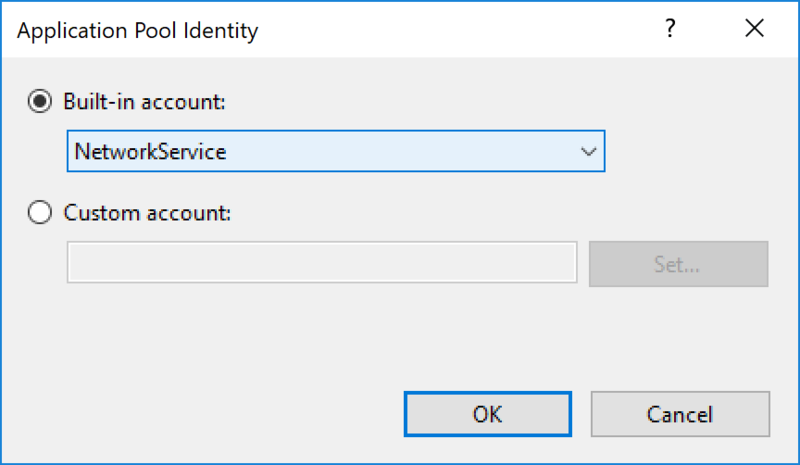 Scroll down to the Identity's configuration, where you may either confirm that the current account is the one you will be using, or modify that setting so that it uses a different account. 5. Launch the project creation. After clicking Next, Bizagi will launch the creation of the project. This procedure may take up a few minutes. Once the project has been created, Bizagi Studio will automatically open it, for you to get started automating your processes.